During the more than forty years of King Solomon’s reign, the monarch and his kingdom faced crises ranging from wars with other kingdoms to devastating natural disasters, prompting him to write in Proverbs 30:16: “Hell and the mouth of the womb, and the mouth of the earth which is not satisfied with water, and the fire never saith, it is enough.” And in the 12 states hard hit by the superstorm Sandy on the final weekend of October, residents were forced to cope with the aftermath of that kind of natural fury, leading to the loss of homes, businesses and properties. Sandy left damage estimated between $10 and $20 billion (yes, billion) in potential losses to individuals and the economies of those states in its path. Preliminary figures provided by US economists indicate that at least 284,000 properties worth about $87 billion were directly impacted by Sandy’s force. And as business and home owners emerged to calculate the damages, real estate professionals and property owners alike voice concerns over Sandy’s impact on the housing and mortgage markets. 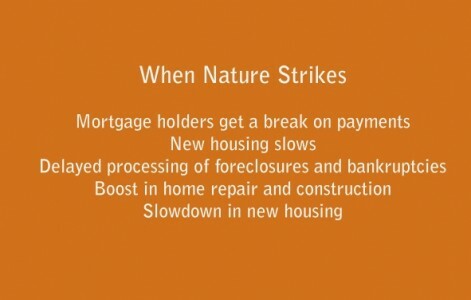 One area of concern for homeowners and property investors is the effect of Sandy on mortgage and foreclosure issues. Although some loan experts are minimizing Sandy’s impact on the home mortgage industry, calling it a temporary blip that could depress mortgage applications in the very short term, federal mortgage agencies Fannie Mae and Freddie Mac have stepped in to assist homeowners facing losses due to Sandy. These two mortgage giants, collectively responsible either directly or through secondary lending services for over half the mortgages held in the US and over 90% of new loan applications, are offering to suspend mortgage payments for up to one year for homeowners in federally declared disaster areas. What’s more, foreclosures and bankruptcy processes have also been put on hold to give property owners a chance to rebuild. This plan gives homeowners and investors a chance to rebuild and recover losses. But it also puts foreclosure processing on hold for numerous properties which will likely end up on the market in 2013, as these cases join the already large backlog of cases still being processed from the housing collapse of a few years ago. Although some mortgage industry experts predict a drop on the number of new mortgage applications in affected areas, this is expected to be a temporary change. And, some housing related industries such as home repair and construction should see a boost due to storm related repairs, but only in the hard-hit regions. Economists doubt that the effects of Sandy will have a significant or long lasting effect on the economy as a whole. Federal efforts to ease the pressure of mortgage payments on distressed homeowners illustrate the wisdom of Jason Hartman’s recommendation for income property investing: maintain mortgages on properties rather than paying them off. In this way, property owners facing disasters of fire and water, such as King Solomon describes, are eligible for relief like the options offered by Freddie Mac and Fannie Mae – and their own money stays in the bank. The Robosigning Settlement: Did the Just Prevail?